Home > News > Tax Credit Cuts: will you be affected? Chancellor George Osborne has said he will act on concerns about the impact of tax credit cuts after peers inflicted a serious blow on the government by demanding major changes. He promised “transitional help” for those affected after his party was defeated twice in the House of Lords. But he vowed to press on with changes designed to save billions from welfare. Tax credits were introduced by the last Labour government to help low-paid families. 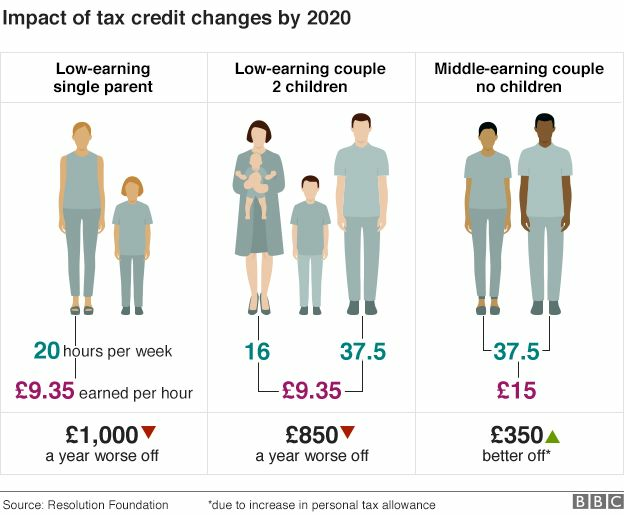 Under the government’s plans, the income threshold for receiving Working Tax Credits and Child Tax Credit is due to be cut from April. Critics say the move could deprive low-income workers of up to £1,300 a year. But the government says it is essential to tackle the deficit and argues most claimants will be better off when other changes, such as the introduction of the new national living wage, are taken into account. ?I will lose all my entitlement of £245 a month. I am a single parent of two children and work 34 hours a week on a salary of £26,000. I am not one of the lowest paid, but that is due to my hard work in trying not to have to claim benefits, and now this kick in the teeth makes me wish I had placed my children first and worked less so I could still qualify for help. This cut will place me in the red every month and as I needed to use my tax credits income to qualify for my mortgage, this will badly affect my chances of getting an affordable deal when my current fixed rate comes to an end. Frankly I?m terrified. I commute a long way in an old car which will need replacing soon, and my children already suffer due to the amount of time I spend at work. The stress for us all is high and it will get worse. I don?t know what I am going to do to make up the shortfall as my budget is planned so tightly. I realise I?m not the worst-affected, but still I am going to be hit hard, simply because I chose to work hard and build up my wages to avoid claiming benefits. I now wish I?d worked the minimum and joined the queue for a council house instead.? How do you feel about the tax credit cuts? How will it affect you and your family? Share your thoughts and feelings on our forum!